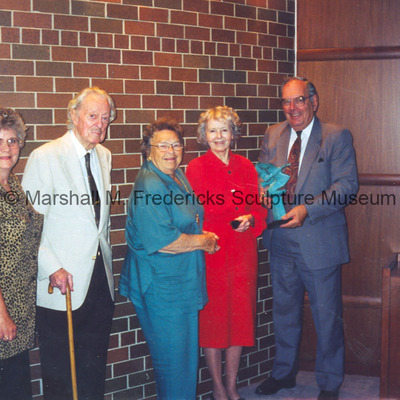 Laura Davis (Special Assistant to the President/CEO, WKKF); Marshall Fredericks; Ruth Mawby; Rosalind Fredericks and Russell G. Mawby (Chairman Emeritus, WKKF) with "Flying Wild Geese"
Small scale bronze "Flying Wild Geese" presented to Russell G. Mawby, Chairman Emeritus, W.K. Kellogg Foundation. 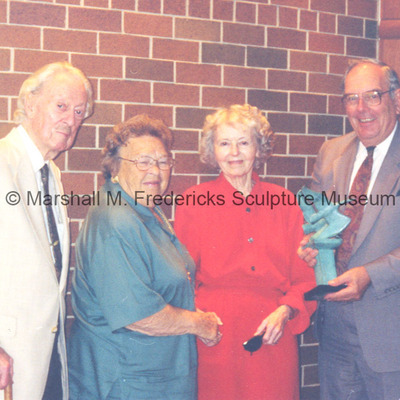 Marshall Fredericks, Ruth Mawby, Rosalind Fredericks and Russ Mawby holding "Flying Wild Geese"